Group work usually brings a negative emotional load attached to it due to previous academic experiences one might already had, such as a colleague who does not show up, work or get involved. This is not the case. 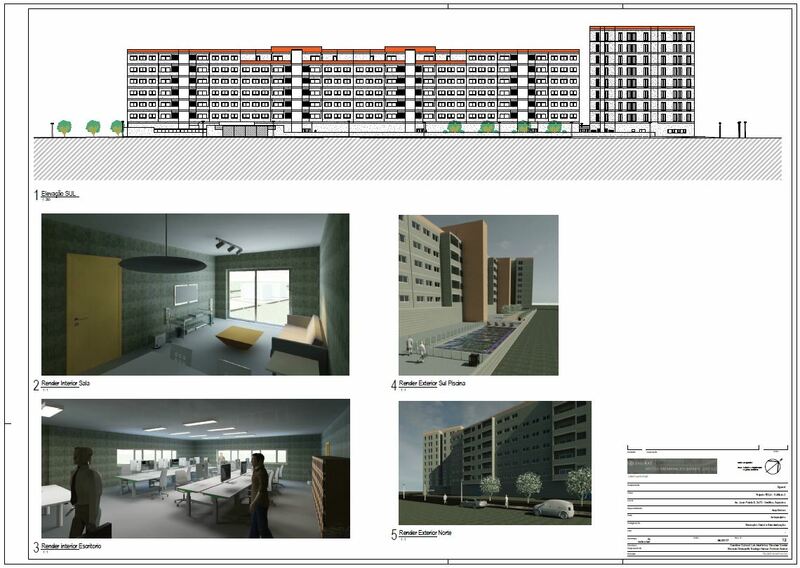 My first work in an International Master in BIM Management was a teamwork with two different softwares. Amongst the four softwares available (AECOsim, Archicad, Allplan and Revit) we chose Revit and Archicad. We were five people from different regions of Brazil and another one from Portugal. Our first meeting was on Skype and the initial task was to define the best time to have our regular meetings since our time zone difference was up to 5 hours. We have exchanged articles, files, shared our computer screen information to help on discussions and making decisions. After each meeting we wrote a minute to register all subjects discussed and the decisions made. Podio and Whatsapp were additional communication channels we have used. We have used Podio to set our meetings, assign tasks and communicate with our Tutor. Whatsapp was used as a daily tool as a means of mutual communication among the group. Google Drive was the platform to develop and deliver the work as well as to store minutes and reports. 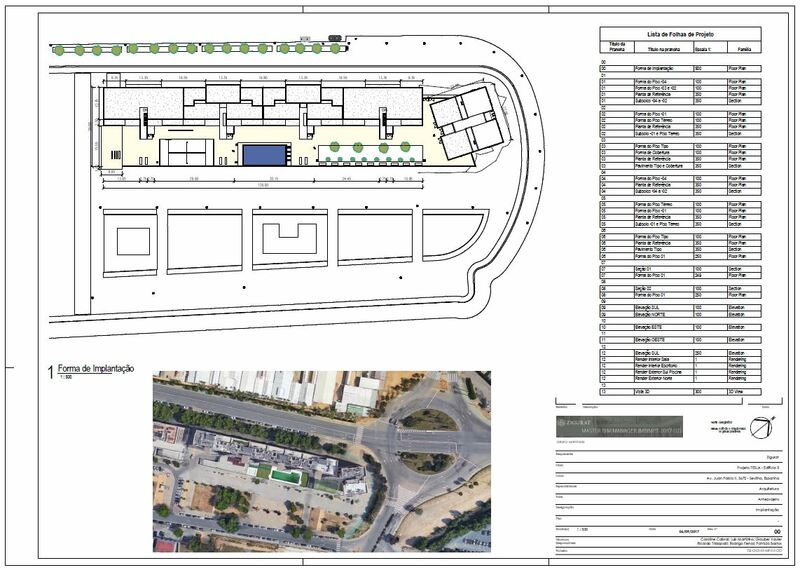 The project consisted of modeling the building number 5 from a residential complex in Seville. The other four buildings had a different typology. 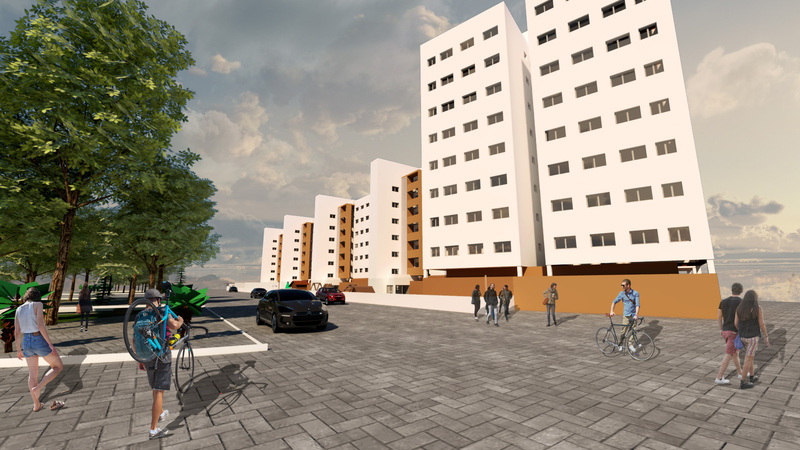 Although the work was focused primarily on building number 5, we decided to model the entire complex. We have also delivered two reports and a coordinator was chosen for this project. After analyzing the project data and its dwg format, we decided to divide our work among the six members according to image 1. The allocation of the workload for our group was different in each software, so all six of us could model at least two different spaces, facing different challenges. We have also prioritized planning and work organization before modeling. It was necessary to define what LOD (Level of Development) we would adopt, archive nomenclature, template and family libraries. Since the beginning of our work, we felt the need to document all decisions we were making which resulted in a Project Manual. This document would determine the work division, file organization, archives, families nomenclatures and the template we would use. The workflow was adapted to each software. 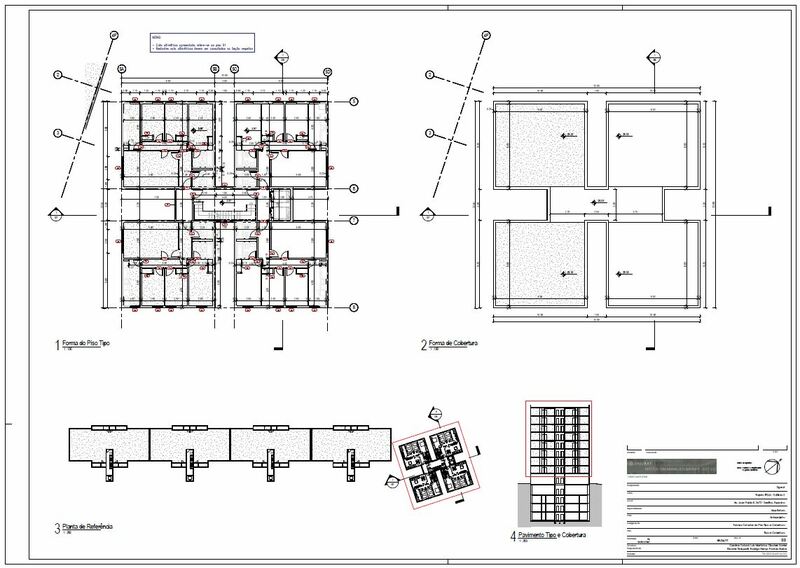 In Revit, we modeled through Revit Server in distinct archives (according to the image above) and linked to a Federate Model. When all worksets were done, we would work on Annotation and Sheets on the Federate Model. In Archicad the workflow was simpler. We worked in Teamwork using BIM Server in a unique model. Storage of archives were done on Google Drive where we would synchronize after changes were made. Both software workflows were tested during our first meetings so we could try out and take our doubts online. 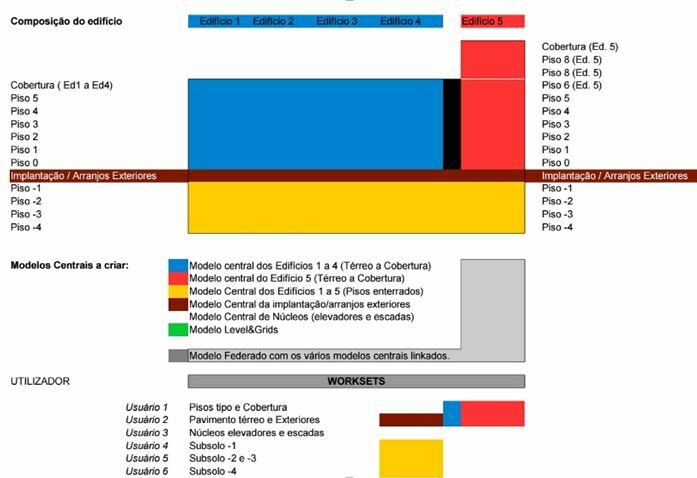 When every work division/workset was finished we would revise them on the Model (Federate Model in Revit) and we would make the needed changes. We delivered the work in native formats (.rvt and .pln), PDF and also in IFC. We also delivered renders made in the native softwares as well as Vray and Enscape. From the beginning, we not only had a very good group interaction but we also learned a lot through each one´s personal and professional experiences. The meetings and communications through Skype and Whatsapp have served a more effective purpose than just delivering an academic work. They were also moments of sharing knowledge and learning in a bigger scenario. The team spirit was present in all moments, no restrictions, creating a bond between us. To work with BIM you need communication, exchange, hard work and collaboration.